The corporate wellness market in Asia Pacific is predominantly driven by the increasing prevalence of obesity, the growing number of smokers, and the rising awareness levels among employers about corporate wellness. The number of key players entering the market is increasing consistently owing to the high demand for corporate wellness services in multinational companies and mid-sized firms. The market in the region was valued at US$3.4 bn in 2015 and is expected to reach US$7.4 bn by the end of 2024. If these values hold true, the corporate wellness market in Asia Pacific is anticipated to register a strong CAGR of 9.0% during the forecast period. Various services are available under corporate wellness programs, such as health risk assessment (HRA), fitness, smoking cessation, health screening, weight management, nutrition, and others, including stress management, diabetes management, and vaccination. The fitness segment took the lead in the corporate wellness market in Asia Pacific in 2015 owing to the rising incidence of chronic diseases, increasing medical cost related to obesity, and the growing awareness about health and fitness among the population of various countries. On the other hand, the smoking cessation segment is projected to expand at an impressive CAGR during the forecast period. An estimated 5.8 trillion cigarettes were consumed globally in 2014 and the consumption is still on the rise. China ranks first in the top ten countries in terms of cigarette consumption. This list also includes other countries in Asia Pacific such as Indonesia, Japan, India, and South Korea. China led the corporate wellness market in Asia Pacific in 2015 and the market in the country is anticipated to expand at a CAGR of 9.1% from 2016 to 2024 owing to the increased development and high adoption of wellness programs. Changing lifestyles, an increase in the incidence of chronic diseases, rapid economic development, and large-scale urbanization are some of the other factors responsible for the growth of the corporate wellness market in China. A large number of public and private players have been providing corporate wellness services in China. Japan is also a prominent market for corporate wellness in Asia Pacific and is likely to remain a key contributor to the APAC market primarily due to the amendments in Japan’s Industrial Safety and Health Act in December 2015. According to the law, health checkups are mandatory for workers and employees. This is likely to drive the corporate wellness market in Japan during the forecast period. Moreover, sufficient government support to address the issue of employee health in a clear and effective manner has created a demand for corporate wellness programs in the country. Another lucrative market for corporate wellness in Asia Pacific is India. The rising number of corporate enterprises in the country is significant to the growth of the corporate wellness market. The willingness among corporate organizations to conduct wellness programs, the growing awareness among individuals about health and well-being, and the increasing incidence of chronic diseases such as diabetes and heart attacks are expected to accelerate the growth of the corporate wellness market in India. Key players operating in the corporate wellness market in Asia Pacific include Central Corporate Wellness, ComPsych Corporation, Optum, Inc., JLT Australia (Recovre Group), Truworth Wellness, SOL Wellness, Sodexo, ConneXions Asia, and Bupa Wellness Pty Ltd. The increasing awareness among employers regarding corporate wellness in Asia Pacific is expected to drive the growth of this market in the region. The increasing number of smokers in Asia Pacific and the growing prevalence of obesity have lead employers to consider corporate wellness programs for the health management and weight management of their employees to avert major health issues in the long run. By 2024 end, it is expected that the Asia Pacific corporate wellness market will reach an evaluation of US$7.4 bn exhibiting a CAGR of 9% between 2016 and 2024. Some of the corporate wellness programs and services which are increasingly being utilized by employers include smoking cessation, fitness, health risk assessment (HRA), weight management, health screening, nutrition, diabetes management, vaccinations, and stress management. Among these, the growing incidence of chronic diseases, increasing awareness about health and fitness, and rapidly increasing cost of medical services will drive the fitness segment to the top. The smoking cessation segment is also expected to emerge as a key service expanding at a remarkable CAGR in the years to come. China in Asia Pacific ranks first in terms of cigarette consumption. Countries such as India, Japan, Indonesia and South Korea are also witnessing an increase in the number of smokers. Thus, the smoking cessation service will be in demand. One of the key factors boosting the growth of the corporate wellness market in the Asia Pacific is the increasing prevalence of non-communicable diseases such as chronic respiratory diseases, diabetes, cancer, and cardiovascular diseases. This has increased the anxiousness among employers and therefore they have started taking steps to promote the wellness and health maintenance of their employees by offering corporate wellness programs. Employers gain by doing so as it reduces the company's overall medical cost as well as boosts productivity. Another factor which is supporting the growth of the corporate wellness market is the increasing support it receives from the government. However, the implementation of corporate wellness programs can be a costly affair as companies need to allot certain amount of budget from the revenue that they have generated. This is expected to deter many companies from incorporating corporate wellness programs and services for their employees. Another factor which is expected to challenge the growth of the market in Asia Pacific is the inefficient execution of corporate wellness services and programs, which in turn is increasing the cost of the companies trying to implement these services for their employees. It is expected the China which has been leading in the corporate wellness market among the countries in Asia Pacific, will exhibit a remarkable CAGR of 9.1% between 2016 and 2024, fueled by the rising development and adoption of wellness programs, increasing incidences of chronic diseases, large-scale urbanization, and rapid economic development. Moreover, the China corporate wellness market is also supported by several private and public players. Japan has made amendments in its Industrial Safety And Health Act which was implemented in 2015 end and due to this law, health check-ups for workers and employees have become mandatory which in turn is boding well for the corporate wellness market in Japan. In addition to this, the government also supports employee health programs which is also pushing the adoption of corporate wellness services in the country. Lastly, India will also emerge as a lucrative market for corporate wellness on account of the willingness among organizations to conduct wellness programs. The increasing incidences of chronic diseases and rising awareness among individuals about fitness, health, and wellbeing will also lead the Indian corporate wellness market to flourish. 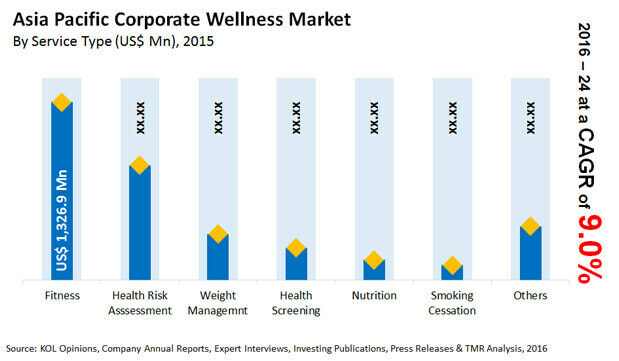 Prominent vendors operating in the corporate wellness market in Asia Pacific include Central Corporate Wellness, JLT Australia (Recovre Group), ComPsych Corporation, Bupa Wellness Pty Ltd., Optum, Inc., SOL Wellness, Truworth Wellness, Sodexo, and ConneXions Asia.